I wanted to revist an old classic. Plus, Elon Musk's car is now in space full of references to this book. I've read this before. Who has not heard of it? Simply put, this short book should be considered required reading. What is the big deal about towels, the number 42, and "Don't Panic"? The cultural impact of this book cannot be understated. Every side story (and there are many) can be found in our everyday lives. Even Google's calculator references this book. The book is basically a collection of amusing one-liners compacted in to a nonsensical story. It starts with Arthur Dent's house about to be bulldozed and ends with the crew cruising around outer space with the improbability drive. All during this, commentary is made about just how silly our lives are. I won't dive in to the plot any further because I believe the plot is not the point of the book. There is barely any plot there. The characters just react to random events with little explicit purpose, and we are receiving the narrative from it. The side stories are what makes the book interesting. Apparently, mice are our rulers. Dolphins are super smart. We misinterpret their squeaks and water tricks. As they left us to our doom, they were really saying, "So long, and thanks for all the fish". Here is my problem with this book. If it was to stand on its own merits, it would get a solid 3. British comedies, movies such as Shaun of the Dead and Monty Python, are simply not funny to me. Humor that feels like randomness for the sake of randomness does nothing for me. A lot of people do seem to like that (e.g. many of the cut-scenes from Family Guy). The bump to a score of 4 came from learning the origins of some very well known references. I felt like I was being educated while also being entertained. For example, I know what the reference "Beware of the Leopard" has to do with government bureaucracy. Being able to chuckle a bit while learning is worth an extra point. 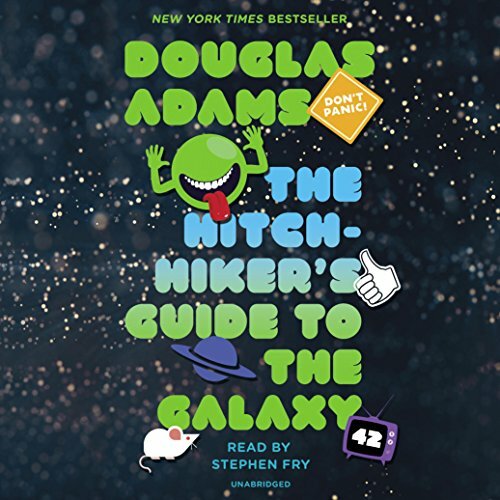 Discuss The Hitchhiker's Guide to the Galaxy in the forums.